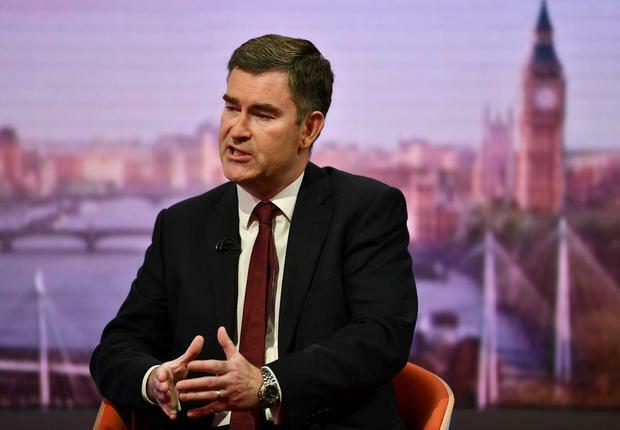 Britain’s Secretary of State for Justice David Gauke appears on BBC TV’s The Andrew Marr Show in London, Britain, March 31, 2019. A SENIOR British minister has made perhaps the strongest warning yet about the prospect of a United Ireland if there is a no-deal Brexit. Justice secretary David Gauke has said he worries “a great deal” about what a crash out Brexit would do to the integrity of the United Kingdom and would put the future of Northern Ireland in the union “in some doubt”. He warned that direct rule would have to be imposed as well as moves towards a possible hard border and raised concern at the impact this would have on the views of moderate Nationalists. He made his remarks ahead of another crunch week in Brexit, where the House of Commons will again try to seek consensus on alternatives to British Prime Minister Theresa May’s deal. Mr Gauke said the UK government cannot afford to ignore the will of Parliament if it votes for a “softer” Brexit. He said that Mrs May would have to look “very closely” if MPs back a customs union with the EU in a fresh round of indicative votes this week. He was asked on the BBC’s The Andrew Marr Show what a no-deal Brexit would do to the country. Mr Gauke replied: “I think it would be very, very bad news indeed” citing the economic consequences which would involved “major disruption” as well as security concerns. He also raised the future of Northern Ireland under such a scenario. “I do worry a great deal about what that will do to the integrity of the United Kingdom,” he said. “At the moment moderate Nationalist opinion in Northern Ireland is reconciled to its position as part of the United Kingdom. “I think that puts it in some doubt, the future of Northern Ireland’s place in the UK,” Mr Gauke said.